So yeah on Tuesday I turned the grand old age of 24! And yes that is a Disney birthday cake! My birthday was a fairly quiet one, but I had an absolutely lovely day that all started out with breakfast in bed whilst opening my cards. I then opened up my presents, which you can see below. In the afternoon Josh and I went out to a really nice local pub for lunch where I had the biggest and best bacon and brie panini I've ever had and we spent a good couple of hours there with some drinks. 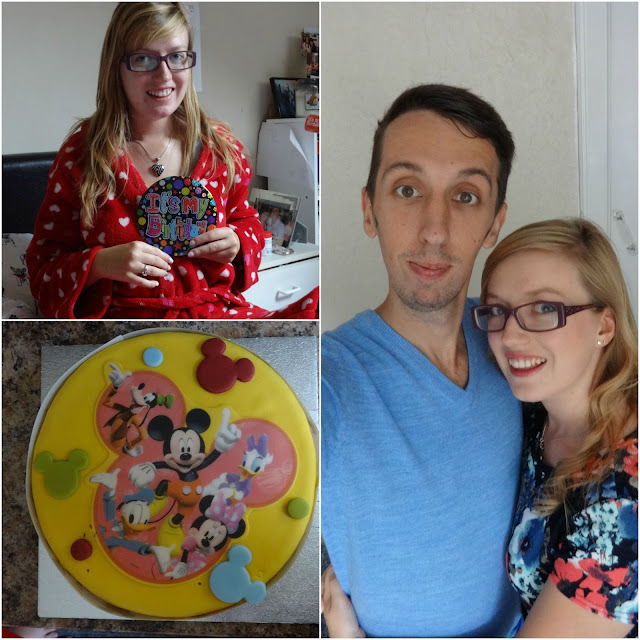 At night my Dad gave me the Disney birthday cake, very fitting seen as Josh and I are off to Florida next week and then Josh and I settled down to watch Marvel Agents of S.H.I.E.L.D (which we've only just started but we're loving) with a glass (or two) of fizz and a slice of cake. On Wednesday night Josh and I went out for yet more food as my Dad and stepmum took us for an Indian as a little birthday celebration. I wore the lovely dress you can just see above, Josh bought it for my birthday and it really has the loveliest colours on it. Just to drag my birthday out a little more too, I have a present to look forwards to after our holiday as Josh is paying for us to go to the Yorkshire Wildlife Park as a present, we're waiting until after the holiday though as I'm going to be pretty busy over the next week.